When Google announced RankBrain, many people were surprised to learn it was the third most important ranking signal. But what does that influence really mean? During a fireside chat at Big Digital Adelaide with Gary Illyes from Google, we discussed RankBrain and the many misconceptions around it. But he said one thing that was quite surprising, and might make people stress a bit less about the unknowns of RankBrain… that in many cases, RankBrain doesn’t even change the order of the search results Google’s other algorithms already determined. “It is from a certain point of view, it is the third most important ranking factor, but in a crap ton of cases it doesn’t even change the order of the results,” Illyes said. In other words, while RankBrain “touches” the search results, it doesn’t actually influence the order of those search results in many of the cases. Google has never said explicitly just how much RankBrain changes the search results, only that it has a stronger influence on the 5% of search queries that Google has never seen before. Illyes had earlier said that RankBrain was not to replace ranking but was to better understand queries. This also puts a different perspective on the meaning of the infamous “third most important ranking signal” that SEOs have been so focused on since the first RankBrain announcement. 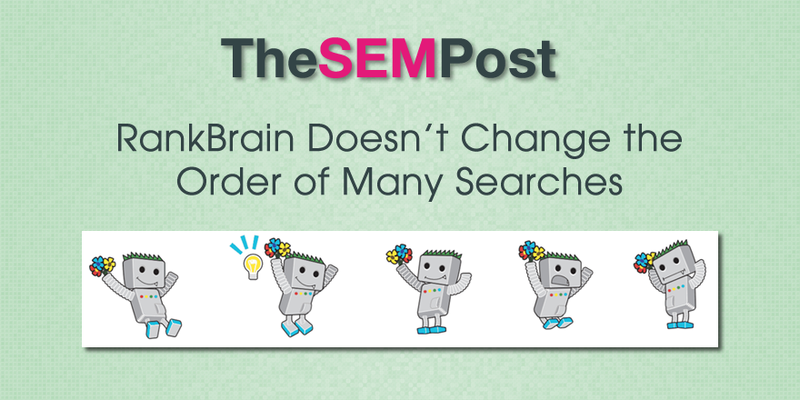 If RankBrain isn’t actually changing a lot of the overall search results, are SEOs better off focusing on the other known ranking factors that are easier for SEOs to control? This would make it seem so.